There is one source for spiritual truth in this world: that is the Word of God, the Holy Scriptures; there are innumerable sources of lies propagated in the world today, from innumerably apparent sources in religion, philosophy, psychology, science falsely called, etc. Ultimately however these derive from the one source of lies that presents the major contention for the Christian, which is the “father of lies” or Satan. One manifestation of false doctrine that promotes certain lies that have in the past infiltrated the church, and even more so in these present days, is Universalism. What does this doctrine declare? The above quote is taken from the Cyclopedia of Biblical, Theological, and Ecclesiastical Literature, Volume 10, 1895, pp. 109-33, Rev. John McClintock and James Strong. We will refer to this work by McClintock and Strong again, later. With the increasing popularity of Universalism and alternate views of (1) Judgment Day, (2) hell (that can mean three different things), and (3) the biblical truth of salvation and what this means, we at T.T.U.F. found it necessary to deal with these doctrinal issues and determine where and how Universalism falls short of scriptural truth; we will also view scripture’s perspective on the aforementioned doctrines. The CREATOR and HIS CREATURES –First of all, the Holy God of creation is by right, owner of all that is in reality (Gen. 14:22; Psalm 89:11), for He is the Maker of all things (regardless of the fact that much of what He has created has been perverted and deformed by the entrance of sin into the world (Gen. 6:5; Ps. 53:3 Is. 64:6; 1 John 1:8 and 5:19; including one third of all the angels, the heavenlies [celestial domain of angelic beings], all mankind, the animal kingdom, and the Earth along with its entire eco-system; Romans 8:21-22). Being the Maker of all things does not necessitate that He is therefore by virtue of this truth, the Redeemer of all things He has made. It’s often said, that “we are all God’s children” but this is in fact, an error. We are all creations of God, but to be His child has established requirements that we will look into later. Due to the fact that Adam was established by God as the steward over the Garden of Eden, as well as all the Earth (Gen. 1:28), and that Adam fell from his divinely appointed position through sin when he succumbed to Satan’s temptation, Satan then became the ruler of this world (Matt. 4:8-9; 2 Cor. 4:4) by the default of Adam, but one day the LORD Jesus will visibly reclaim His rightful ownership (Matt. 13:38, 44) that He obtained by His atonement via the shedding of His holy blood upon the Cross (Rev. 5:1-9). ALL RISE! COURT IN SESSION! The LORD Jesus at the end of the world will preside over all of His creation as its Judge, and this is amply demonstrated by countless verses recorded in scripture; God is the Judge and yet the LORD told us that the Father has committed all judgment to the Son (John 5:22); verses that reveal God as a Judge are throughout scripture, but here are just a handful:Psalm 82:8 - "Arise, O God, judge the earth: for thou shalt inherit all nations." Psalm 50:6 - "And the heavens shall declare his righteousness: for God is judge himself. Selah." Psalm 68:5 - "A father of the fatherless, and a judge of the widows, is God in his holy habitation." Psalm 96:10 - "Say among the heathen that the LORD reigneth: the world also shall be established that it shall not be moved: he shall judge the people righteously." Acts 10:42 - "And he commanded us to preach unto the people, and to testify that it is he which was ordained of God to be the Judge of quick and dead." 2 Tim 4:1 - "I charge thee therefore before God, and the Lord Jesus Christ, who shall judge the quick and the dead at his appearing and his kingdom;"
Hebrews 12:23 - "To the general assembly and church of the firstborn, which are written in heaven, and to God the Judge of all, and to the spirits of just men made perfect,"
John 12:48 - "He that rejecteth me, and receiveth not my words, hath one that judgeth him: the word that I have spoken, the same shall judge him in the last day." The Greek word used in most of the above references (among dozens of others) is krino, which means “to decide mentally or judicially”; by impl. “To try, to condemn, punish, judge, determine, go to law, call into question, avenge, damn, decree, ordain, sentence to”. Looking at the various renderings of this word (krino), and the general references of scripture above, it’s easily discernible that God the Son, the Lord Jesus Christ unto Whom the Father has committed all judgment to, will in fact judge all the world. He shall call into question, and determine by going to the Law of God which is perfectly Holy, and using it as the Standard by which all souls (unsaved) will be measured, who is guilty of transgressing the Law (Romans 2:12). Rev 20:11 - "And I saw a great white throne, and him that sat on it, from whose face the earth and the heaven fled away; and there was found no place for them." 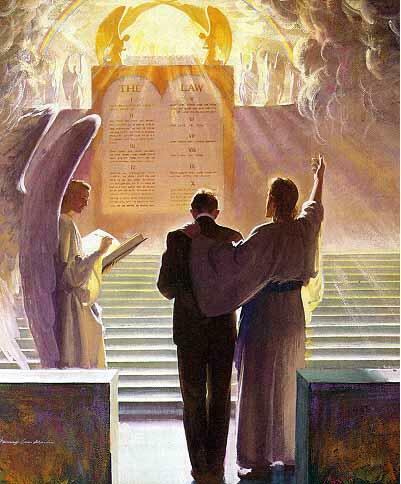 Rev 20:12 - "And I saw the dead, small and great, stand before God; and the books were opened: and another book was opened, which is the book of life: and the dead were judged out of those things which were written in the books, according to their works. " Rev 20:13 - "And the sea gave up the dead which were in it; and death and hell delivered up the dead which were in them: and they were judged every man according to their works." Rev 20:14 - "And death and hell were cast into the lake of fire. This is the second death." Rev 20:15 - "And whosoever was not found written in the book of life was cast into the lake of fire." Note that there are books (plural) opened, and another book, the book of Life; whoever was not found written in this book of Life was cast into the lake of fire. Apparently they were judged out of those things written in these other books: presumably these books record the deeds, thoughts and intents of these individuals who will stand at this Judgment. These books will be utilized to incriminate the souls before the Holy God, and there will be no appeal, no settlement, no ‘greasing the judge’ with a little cash flow on the side. All decisions are apparently final, particularly since those who are imprisoned in hell (that is, hades - the abode of the dead) cannot escape from there (Luke 16:26) and according to Revelation 20:14, death and hell (hades, along with its entire population) are both cast into the Lake of fire. I’ve often said in utter sobriety, that “there are no exit signs in hell”, and such is the case. “The duration of future punishment is most definitely represented in Holy Scripture as absolutely endless (Mark 9:44-50; Revelation 14:11, etc.). Even if the word eternal does not in itself denote absolute endlessness, it is surely a different matter when eternal pain is without ally limitation associated with eternal life (Matthew 25:46). We will here only call to mind the fact that those who maintain the contrary of restorationism can bring forward numerous and plain statements of the Lord and his witnesses; at any rate, the possibility of an endless misery is most distinctly declared in Matthew 12:31, 32; and such words as those in Luke 16:26; Matthew 25:10, 41; 26:24 could hardly be vindicated from a charge of exaggeration if he who spoke them had himself seen even a ray of light in the outer darkness, and been able and willing to kindle it before others' eyes. In no case could such a ray be seen without previous contrition and conversion but, viewed even psychologically, this latter is certainly nowhere to be looked for less than in a hell of sorrow and despair, not to say that the Gospel nowhere opens up to us a certain prospect of the continuance of the gracious work of God on the other side of the grave.He who here talks of harshness must by no means forget that sinful man is a very partial judge in his own case; that nothing less than the highest grace is boldly and stubbornly set at naught in the case here supposed; and that there always will be, according to the teaching of Scripture, an equitable distinction in the rewards as well as in the punishments of the future (Luke 12:47, 48; Romans 2:12 sq.). Ay, even if men might flatter themselves with a diminution or postponement of the punishment, there still would always be a remembrance of the incalculable mischief which they had done to themselves and others, and this would be a dark cloud before the sun of an eventual happiness. Least of all could they hope for such an end who have known the great salvation, and all their lives ungratefully despised it (Matthew 11:24; Hebrews 2:3). As to the heathen and others who, entirely without their own fault, have missed the way of life, Holy Scripture nowhere compels us to believe that these should summarily, and on that account alone, be the victims of an eternal damnation. While there is only one way of salvation (Acts 4:12), the Merciful One will make it known to men in some way (1 Peter 3:19).We can safely leave to God the justification, even in this respect, of his own government of the world; but we must take careful heed that we do not try to be more merciful land wise than he to whom sin, as long as it continues to be sin, is thoroughly damnable. Even in preaching the Gospel, his servants are not free to leave this darker side entirely unmentioned. The statement of it should always be joined with that of the friendly light of grace, and let the preacher take care that he does not lead his hearers in the way of despairing fear or unbelieving doubt by yielding to the desire to paint hell as black as possible. The best statement of the prospect of the sinner is that of going to his own place, i.e. to the land of his own choice, where he may still continue to dwell." Anne Kisly, co-writer for The TRUTH UNDER FIRE has made the following contribution to this article dealing with Eternal Life, Eternal punishment, Judgment, and What Are We Saved From? Referring to this one passage of Scripture is enough of itself to settle the question of eternal punishment. But there are those who vehemently oppose the doctrine of eternal punishment and hell and subscribe rather to the many heresies of the day. There are those who will not submit to the teaching and authority of Holy Scripture. Why? It is because they presume to sit in judgment upon what is and what is not worthy of God to do. Though born in sin, people continue to live in sin, in folly, and rebellion against God, though they neglect salvation in and through Jesus Christ, somehow it is imagined that afterwards all will go unpunished. They reason away these particular passages of Scripture with the imbalanced understanding of God’s benevolence, goodness and mercy. They emphasize the disproportion between a few years of sin and an unfair endless eternity of punishment. They take it upon themselves to decide that it is inconsistent with their idea of God and that He would never allow such a thing as eternal punishment. What they attribute to the government of God, we in any human government would consider to be completely unjust, namely, an inability to punish evil-doers. THE ARGUMENT: If we deny Eternal Punishment, we must also deny eternal anything because it is the same word which is used in every instance to express the idea of endless continuance…FOREVER! There are about seventy passages in the Greek New Testament where the word "everlasting/eternal" occurs. The Greek word used is “aionios” which obviously means: perpetual (also used of past time, or past and future as well):--eternal, for ever, everlasting, world (began). Those who oppose the doctrine of eternal punishment endeavor to prove that the word “everlasting” does not mean everlasting in the Greek. For this very reason we will quote several scriptures in which the Holy Spirit applies it in a variety of ways. Note: The same word that is applied to the punishment of the wicked is also applied to the believers’ life, to the salvation and redemption, and the glory to which we look forward to. More importantly…it is applied to God, and to the Spirit. Therefore, to single out a handful of scriptures dealing with eternal punishment and say that everlasting means something else is absolutely absurd, for the Scriptures themselves will indeed interpret the Scriptures, and the message is absolutely clear and true. This word expresses what everybody knows to be endless! You cannot stop short with the question of punishment or you must deny the rest. How much better, and wiser, and safer it would be for our fellow men to flee from the wrath to come than to deny that it is coming; or that, to deny when it does come, it will be eternal. In a recent discussion with a confused friend, we debated about this very issue after Jim posted an interview/video clip on his wall in Facebook. The video features Doug Pagitt, one of today’s leading New Age/Emergent Church teachers who denies that hell is a place or that a future punishment will exist. In fact he denies that heaven is a literal place and that all men whether Christians/Muslims/Buddhists or whatever will end up in the same place after death. This will help you better understand the emergent church movement and what happens when you depart from the authority of Scripture and refer to it as "Pop-phrases”. He argued that the scriptures which speak of "unquenchable fire" — of an "undying worm" — of a "fixed gulf" — of "abiding wrath" are all figures and are not to be taken literally. What then is the meaning, what is the purpose of such scriptures? Granted that the ‘fire,” the “worm, “and the “gulf” are figures, but figures of what? Of something that lasts for one day, something temporal? Absolutely not! What then is undying…fixed….and abide mean? Do they somehow suggest something fleeting? It is rather something which is eternal, if anything is eternal. Whether you are studying in Hebrew, Greek, Latin, English or any other language under heaven, the word Eternal will never mean temporal. In Matthew 1:21, the angel said to Joseph, "You shall call His name Jesus, for it is He who will save His people from their sins" . When the God the Father gave the incarnate Son a name, JESUS, the Greek transliteration of the Hebrew name Joshua, means "Savior". The Bible declares that "there is salvation in no one else; for there is no other name under heaven that has been given among men, by which we must be saved" (Acts 4:12). Jesus is the Savior–and his coming as Savior has been the good news, the joyful news from throughout history! Because of the loose and even perverted interpretations of Scripture, we need to address the question, “A Savior to save us from what?” It’s a good question and one that must be answered. The word ‘savior’ implies that we need to be saved from something; we all can clearly see that. Saved is a synonym for rescued or delivered. It implies there's some kind of threatening condition, a dangerous, desperate, or deadly condition from which we need to be rescued. The question is, from what? If you listen to what some believers and even preachers say about the gospel, you would think that the condition of unbelief doesn't sound so grave. The grave condition of sin is taken lightly, and God’s grace has become cheapened by our inability to cope and accept the fact that we are fallen creatures. The fact is that we do not posses the ability to save ourselves from the affects of that sin, nor are we acceptable to God in our fallen state. In today’s society, one gets the idea that humanity mainly needs to be rescued from its lack of fulfillment. Our plans, our relationships, our dreams haven’t turned out exactly the way that we had hoped that it would. We are always lacking and in want, unfulfilled and desperate for happiness. According to the world's view which is sometimes the view presented in the gospel that some are preaching, Jesus will fulfill all that we want him to. Just come to Jesus, and he will make you rich; buy you a car; fix your marriage; help you climb that corporate ladder; remove all your troubles, and fulfill all of your dreams. But is the danger from which you need to be saved, the shattering of all your dreams? Was the purpose of the shedding of the blood of Jesus at Calvary to rescue us from an unfulfilled life? Sure it's true that the gospel does fill the unfulfilled life, but this is secondary to the primary purpose. Genuine conversion means that you now belong to God and the Holy Spirit takes up residence in your heart. It has a dramatic effect on your life and yes, you will experience a new reason to live; have the hope of eternal life and the promise of heaven. And when you experience the power of the Holy Spirit to change you, you'll see victory over the debilitating habits and passions that feed your sinful nature. But this is not the primary issues in salvation! The real problem is sin and guilt…and as a consequence of sin, separation from God and eventually eternal punishment. That's the issue. God sent Jesus Christ to rescue us from the consequence of our sin, and everybody falls into the category of ‘sinner’. It doesn’t matter who you are; what you've done, what you have or have not,or how educated or ignorant you are...you and I are sinners and the Bible declares that "All have sinned and fallen short of the glory of God". GOD IS HOLY, and He is angry, "angry at the wicked everyday" because we have broken His holy law and rebel in our hearts against Him. Unless something happens to change our condition, one is most definitely on the way to eternal hell and punishment. For this reason we need to be rescued from the consequences of sin. This is the principal issue that the gospel solves. Coming to Christ means the end of you and me, and a new life in Jesus Christ, for it is He who purchased us through the shedding of His own blood in order to redeem us. The church needs to get back to remembering that God sent His Son into the world to save His people from their sins....not their unfulfilled dreams. A proper presentation of the gospel should focus on that. The angel told Joseph: "He is the one who will save His people from their sins. That is why you must name Him Jesus." Humanity's real destroyer is sin, and the guilt for sin is a real guilt, a God-imposed guilt that damns to eternal hell. That is why people need to be saved, rescued, and delivered. That is what people must understand in the gospel, and that is what we must proclaim to the world around us. What are we saved from if not from sin and death and eternal punishment! The death of Christ is the climax of the history of man because the crucifixion of Christ is the event which secures redemption.We have spent much time in study and research to bring this information to you, the reader. We realize that this is a very long article so we have broken it down into several parts in order to cover as many aspects as possible, and to clarify what the Bible teaches about it. I cannot express how important it is to know what the Scriptures say about this doctrine. To deny it would be to deny the authority of the word of God. To replace what God hath said with intellectual philosophy and fallen human nature is deadly. Would God purposely mislead his children? Would he bring false warnings to the lost? Is that why Jesus came to die on the cross…to save us from nothing? Entertaining such denials can only weaken Christianity, destroy evangelism, and lead many to the door of hell itself! There is only one whose goal and purpose it is to do just that, his name is Satan, the Father of lies. We will now conclude Part 1 of this article with some valuable insights from Dr. Herbert Lockyer which are pertinent scriptures and commentary here for your review and further study. (h) It is to be finally destroyed, Hosea 13:14; I Corinthians 15:26 (NOTE: In the context of the wicked, Jude 1:5 states, “I will therefore put you in remembrance, though ye once knew this, how that the Lord, having saved the people out of the land of Egypt, afterward destroyed them that believed not.” The Greek word for destroyed is “apollumi, ap-ol'-loo-mee” - the base of the word 3639; to destroy fully (reflexively, to perish, or lose), literally or figuratively:--destroy, die, lose, mar, perish. See Greek 575 (apo) a primary particle; "off," i.e. away (from something near), in various senses (of place, time, or relation; literal or figurative):--(X here-)after, ago, at, because of, before, by (the space of), for(-th), from, in, (out) of, off, (up-)on(-ce), since, with. In composition (as a prefix) it usually denotes separation, departure, cessation, completion, reversal, etc. See Greek 3639 (olethros) from a primary ollumi (to destroy; a prolonged form); ruin, i.e. death, punishment:--destruction. (2) Spiritual Death means to be separated from life in God. As in material death there is the separation of the spirit from the body, so in spiritual death there is the separation of the spirit from God. (l) Its banishment is proved by love, I John 3:14 (interesting test of true conversion). (i) It is described as banishment from God, II Thess. 1:9; society with the devil, Matt 25:41; a lake of fire, Revelation 19:20; 21:8; unrelieved darkness, Matt 25:30; II Peter 2:17; a resurrection to eternal condemnation, Daniel 12:2; John 5:29; Matt 25:46; eternal torment, Luke 16:23-26. After death there is a destiny, and God’s Word sets down this destiny as being one of two alternatives know as heaven and hell. There is a state of unbroken peace and pure joy in the presence of the lord for all the redeemed; or there is a banishment from God’s presence to a state of misery and dread. Moreover, these two states of being are declared to be absolute, fixed, and eternal. At death, the soul, after life’s probation, passes into a destiny, absolutely fixed and final. With unmistakable clarity the Master spoke of heaven and hell. But while certainties are set down so that no man can miss them, yet details are treated with divine reserve. Unspeakable anguish and woe are indicated by the explicit parables of judgment. For example: We have the great gulf fixed – the door shut which cannot be opened-the outer darkness with its weeping and gnashing of teeth. Doubtless there is a sharp, emphatic division in Christ’s teaching somewhat repugnant to the modern mind. He speaks not only of heaven where “ancient dreams as substance are,” but of hell, that dreary abode, where “the worm dieth not and the fire is not quenched.” There are wheat and tares; good fish and bad; sheep and goats; loyal and disloyal; saved and lost; those who do His will and those who do it not; children of God and children of the devil. Each soul goes to its place. “Unquenchable fire” (Mark 9:43, 44). “Thy whole body cast into hell” (Matt. 5:29-30). “Everlasting fire (Matt 25:41, 46). Yet, speaking so faithfully of the reality, the fearfulness, the eternity of God’s just retribution, Jesus always displayed his matchless love and his unlimited grace, for it was the contemplation of the sinner’s doom that caused his tears. Can you not hear the sob of unwanted love in his plea, “How often would I have gathered thy children together as a hen doth gather her brood under her wings, and ye would not” (Luke 13:34, 35; see Luke 19:41). It is not generally realized that Jesus spoke more frequently of the place of woe than the abode of eternal peace. His most graphic and detailed representation of the place, originally prepared for the Devil and his angels, is the illustration he used for the rich man Lazarus. The rich man is tormented in hell’s flame, not because he was rich, but because his soul’s deepest interests were neglected. He prays in agony for a drop of water to cool his tongue, but his suffering and despair are increased tenfold by the sight of the felicity of the beggar whom he had despised and neglected, now at a heavenly banquet, and also by the fact that a great gulf is fixed between paradise and perdition. There was no purgatory in which the rich man could cleanse himself of his sins and errors and then recline of Abraham’s bosom. Hell, as we understand it from the teaching of Jesus, means eternal separation from God. What must be borne in mind is that GOD IS NOT WILLING THAT ANY SHOULD PERISH BUT THAT ALL SHOULD COME TO REPENTANCE (2 Pet. 3:9) and therefore, never sends sinners to hell. The eternal punishment of the wicked is not arbitrarily imposed by God but is the inevitable outcome of sin itself – the confirmation of sinners in their own self-chosen course, being left by God to reap the full, dire consequences of sin. Having persistently separated themselves from God, sinners, dying in their sin, banish themselves from his presence and abandon themselves to reap the full harvest of their own evil character and of their rejection of Calvary’s provision for their sin. “God willeth that all men should be saved” (1 Timothy 2:4 RV), but to the wicked, Jesus was obliged to say, “Ye will not come to me that ye might have life” (John 5:40; see John 3:19). Although he was the Son of God, with power, Jesus never compelled submission, “If any man will.” Because he died that men might be forgiven of all their sin, Jesus gives to men not a chance, but EVERY CHANCE TO ACCEPT HIS GIFT OF ETERNAL LIFE. Another reason for the two alternatives of heaven and hell lies in the contrast between those who are holy and those who are sinful. Our sins are set in the awful light of God’s countenance, not in the partial discernment of man. Evil cannot stand in God’s presence, so we have those awful sentences – “I never knew you” – "Depart from me” – “The wrath of the Lamb". Beyond the explicit teaching of Jesus and the irreconcilable nature of good and evil, there is the conclusion to be drawn from the facts of life. Habit makes character, and character fixes destiny. The young are impressionable and plastic. The old find it almost impossible to change. The repentance of an old man is one of the rarest of spiritual experiences, as any preacher will tell you. Thus it is not difficult to realize that when a soul passes out into eternity, it continues to be what it was in time, only more fixed in an inevitable destiny (Revelation 22:11). May you and I have the assurance that, when the day breaks and the shadows flee away, the realms of the blest will be our everlasting abode! Today on this morning's talk-radio programs, there was a lot of exposure to a recent claim by our President concerning "Collective Salvation." The sound clip was from a recent statement made by President Obama. He said that his individual salvation would not take place without the collective salvation of all. It appears very close to the Universalist Doctrine, except Obama himself is the savior to whom the mission of collective salvation was given. When I have heard such statements in the past, the speaker was deemed by Therapists to have a Messiah Complex with a God fixation, in conjunction with schizophrenia. It shouldn't be too long before The Great Whore of Babylon is bedding down with the politicians of the world. The writing is on the walls all around us. Thank God, in the person of Jesus Christ and the power of the Holy Spirit that my individual salvation is not supplied by a man with mental defect, but by God my Savior and Lord.